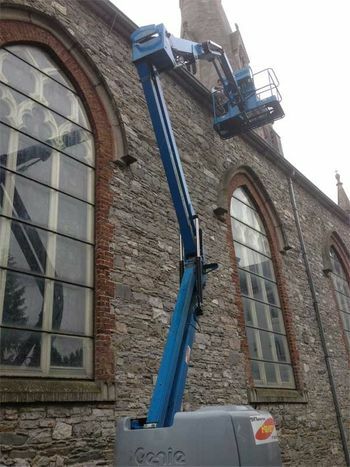 A1 Naas Contract Cleaning provides a comprehensive gutter cleaning service to clients within the Naas, Maynooth and Celbridge areas. Our service involves the cleaning and removal of all types of gutter blockages, from dead leaves to weed growths. Our gutter cleaning service includes the removal of fungi and moss build-up and a comprehensive cleaning of external gutters including all soffits and fascias. We’re available to clean all types of gutters from traditional timber gutters to more modern PVC plastic gutters. We bring up your gutters as if they were new; which has a beneficial effect on the external aesthetic of your property. Do you need your gutters cleaned and cleared of blockages? Then get in contact with A1 Naas Contract Cleaning today. Gutters left unclear can lead to blockages and water retention on a property which can be a direct cause of leakages and dampness in a building. Water seeping into a building over time can cause untold damage and can be extremely expensive to repair. Why don’t you save yourself the headache and the significant financial burden by availing of A1 Naas Contract Cleaning’s gutter cleaning service. Our professional team are able to quickly and efficiently clear and clean gutters in all types of properties. Are you worried about the negative effects that blocked gutters can have on your property? Then get in contact with A1 Naas Contract Cleaning today.